I have created an app for Windows that allows to you easily make desktop shortcuts to your ResidualVM games. 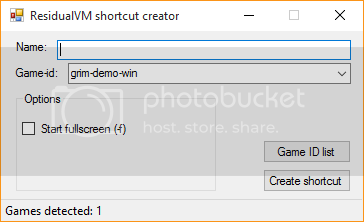 The app automatically detects your installed ResidualVM games, and from there allows you to make desktop shortcuts for them. It also includes a full in app game-id list, so that you can match up your game ids with the game's full title. Any feedback is greatly appreciated. Should run on Windows XP up. Windows XP users will require .Net Framework 4 if it's not already installed. There is also a version for ScummVM available here.